Every year oil and gas companies waste hundreds of millions of dollars’ worth of natural gas on public lands. The land, air, and water are part of New Mexico’s cherished outdoor heritage and we need to hold developers accountable with common-sense rules to protect our resources, like BLM's methane waste rule. Latino leaders from across New Mexico support the rule and we appreciate their leadership around this issue, which is important to the state’s Latino community. As we celebrate National Park Service’s centennial, we must reflect on the next 100 years and how the federal agencies managing our public lands should reflect the multicultural diversity of our country. Federal agencies must facilitate the inclusion of different cultures when managing public lands, but we must also organize as a community to accomplish the goal of inclusion. Only by appreciating the many heritages and cultures that make our public lands and country great can the next 100 years of America’s parks be successful. Methane waste impacts state revenues, harms the environment, and threatens the health of New Mexicans. Each year, the State of New Mexico loses millions of dollars from flaring, venting, and equipment leaks of natural gas. Royalties are not charged on wasted gas, further robbing our state of revenue, while we face a $120 million budget deficit. Toxic chemicals are also released, aggravating asthma and lung diseases. Latinos are three times more likely to die from asthma than other racial or ethnic groups. The Bureau of Land Management held a public hearing in Farmington in February 2016 to address waste of natural gas through venting, flaring, and leaks during oil and gas development. This lost gas is an economic waste, as communities are missing out on royalties that would be generated from the sale of the gas. Industry cites their own economic argument for not capturing and selling the gas: implementing the new regulations would cost jobs. However, implementing the regulations would result in exactly that: jobs. Industry shouldn't fear a change from the status quo. This year marks the 100th anniversary of the National Park Service, which has preserved 84 million acres of cultural and historic landscapes that have helped shape America. However, the people that make up our country look a lot different than they did 100 years ago. Over the next century, the NPS, along with other public land management agencies, need to be more inclusive of and reflect America’s changing cultural landscape. In 2014 on New Mexico’s public lands, oil and gas producers wasted enough methane to heat more than 168,000 homes for an entire year. New Mexico loses an estimated $100 million worth of natural gas, annually. Latinos face disproportionate exposure to toxic air pollutants and are 3x more likely to die from asthma than other racial or ethnic groups. The BLM intends on reigning in methane waste on public lands, and for many communities in New Mexico, this welcomed change cannot come soon enough. For former BLM State director, Juan Palma, getting kids outdoors and exposing them to the wealth our public lands is important, especially for Latinos. Although we have deep, multi-generational ties to the land, the concept of "public lands" is foreign to many. As the U.S. Latino population continues to grow and Latino communities are often directly impacted by public lands, Mr. Palma- the current Chief Conservation Officer of HECHO- believes involving Latino communities in the conservation of our public land is more paramount than ever before. For over 50 years, the popular Land Water and Conservation Fund (LWCF) protected over 40,000 park projects, along with hundreds of thousands of acres of public lands. In September, LWCF was left to expire, even though it garnered strong, bipartisan Congressional support. Instead of fighting to renew the Fund and conserve public lands for all to enjoy, House Natural Resources Committee Chair, Rob Bishop (R-Utah), proposed a drastically altered LWCF, which would turn this once-effective conservation tool into a slush fund for Bishop's oil and gas industry cronies. Latinos have a unique connection to western public land, as many of us have lived on and used these lands for generations; however, our voices and opinions are often left out of the conversation. Former BLM State Director of Utah Juan Palma makes the case for why more Latinos should get involved in the public land decision-making processes—including an opportunity to have your voice heard in the discussion about protecting public land in and around Moab, Utah. HECHO Director Camilla Simon co-authored an important op-ed in The Hill reflecting on the expiration of one of the most beloved U.S. conservation programs. In 2010, LWCF generated $442 million and created 3,000 jobs. “Letting the Fund expire will be a lasting black mark on the leadership of this Congress,” says Arizona U.S. Representative Raul Grijalva. The LWCF protected fish and wildlife habitat for more than 50 years. Latino sportsman and HECHO Advisory Board Member Kent Salazar speaks out about the benefits of this program that increases access to public lands, preserves Heritage Sites, and provides educational opportunities to Latino communities. Last week, four New Mexico delegates took a stand in Washington D.C. by asking for strong methane waste rules to be developed by federal agencies. Many Latinos and other Americans live in close proximity to oil and gas wells in the West, which can have devastating impacts to the health of the people living in these communities. Latinos spend more on outdoor gear than many other groups, but outdoor retailers are falling short when it comes to reaching out to this important market. Leaders of diverse outdoor groups share their thoughts on a broader, more inclusive alliance of recreationists-- one that incorporates all user groups and speaks to all groups when talking about conservation. At the 32nd annual National Association of Latino Elected and Appointed Officials conference this year, the topic of conservation was missing from the formal agenda. Latinos have direct ties to the land and a rich cultural heritage of using public lands. Constituents and participants hope to see conservation topics added to future agendas. U.S. Senator Tom Udall (NM) raised concerns with his fellow DC lawmakers over oil and gas development in areas rich in indigenous culture and heritage. Udall called for protection of the Chaco Canyon area; however, there are also other vital lands in New Mexico that warrant protection. After revisiting a decision to open 90% of Southwestern Colorado to oil and gas development, the BLM announced that a Master Leasing Plan would be developed for the region. This was a major victory for landowners, recreationists, and conservationists— as all those affected will now be included in future development discussions. The 50-year old LWCF program has preserved public lands that hold deep Hispanic roots. Access to these lands shape the lives of adults, as well as children, of all socio-economic backgrounds and ethnic groups. We need to support the continuation of LWCF, and continue to protect these important connections within the Latino community. New Mexico U.S. Senator Martin Heinrich has taken a stand by endorsing the continuation of LWCF— a piece of legislation vital to the protection of scenic rivers, spectacular canyons, and sites important to the heritage of Latinos. Thanks, Senator Heinrich, for working to protect of our public land. 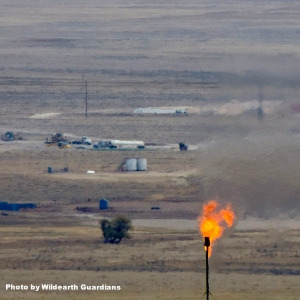 As NASA is working to determine the cause of the 2,500 square mile methane plume that is hanging over northern New Mexico, the question of our continued acceptance of methane flaring and venting by oil and gas developers begs to be discussed. The BLM is drafting legislation to protect our communities from this type of dangerous pollution and it is our duty to get involved with this process to protect future generations. Under Juan Palma’s leadership, large swaths of western public land has been protected from oil and gas development. The retired Utah State Director of the BLM opens up about collaboration and smart planning, his time as an immigrant migrant worker, and his conservation legacy. Last week, BLM announced plans to open more than 90% of public lands around Tres Ríos to potential oil and gas development, ignoring landowners’ and local officials’ pleas to consider aMaster Leasing Plan for the area that involves input from local residents. Without including public input, the BLM has put into jeopardy the values and way of life Coloradoans hold dear. For decades, U.S. presidents have protected lands through the Antiquities Act, a piece of legislation that circumvents the typically slow-moving, cumbersome pace of Congress. Now, the Act could face substantial gutting by members of Congress that are beholden to special interests If we want to continue protecting land important to Latino heritage, we must protect the Antiquities Act. Polling a range of Latino experts about top issues for Latinos in 2014, immigration, the Affordable Care Act, racism, and the environment are at the top of the list. Looking ahead to 2015, advancement of conservation policy is on the front burner. Latino voters are flocking to polls to voice their opinions on environmental issues. Clean air, water, and space for children to play are fundamental rights of all Americans. Involving Latinos in the conservation discussion is becoming increasingly necessary when attempting to include all public land users. Latino communities are must be included in environmental conservation because Latinos have rich cultural heritage on southwestern lands. HECHO, a group encouraging Latinos to get outside and join in the conversation about conservation, is making waves with its poll results. An overwhelming 93% of Latinos support government protection of public lands, and the fact that Latinos are the fastest-growing group in the U.S. forecasts the increasing importance of Latinos in conservation discussions. Although often missing from discussions about conservation, Latinos have direct and cultural ties to the environment and outdoor recreation. Therefore it came as no surprise that 93% of Latinos believe protection of public lands by the U.S. government is very important, according to a HECHO poll. As a result of centuries-old heritage in the Southwestern U.S., Latinos are deeply connected to our public land. It is no surprise that a recent poll found Latinos consider conservation of public lands important. As the Latino population in the U.S. continues to grow, federal agencies are now actively seeking input from Latinos before conservation and land decisions. Results of a recently conducted poll show Latinos overwhelmingly support conservation of public lands. Results also demonstrate Latinos want to be involved in the conservation decisions and planning. Cultural ties to U.S. southwestern lands have instilled conservation values in many Latinos, and we must foster these values and include all interested stakeholders in the decision-making process.